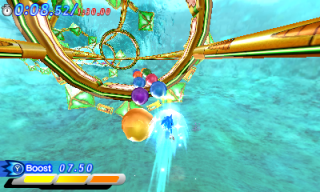 The Special Stage in the Nintendo 3DS version of Sonic Generations uses the same concept as the Sonic Heroes Special Stage, where Modern Sonic runs through a half-pipe and collects spheres scattered along the pipes while dodging bombs. Each Special Stage is unlocked after clearing both Acts of each level. In the Special Stages, the Chaos Emerald is floating towards the end, and the goal of the stage is to catch up to the Emerald before it reaches the end of the stage. To do this, the player must collect spheres to build up boost power, while dodging bombs that will knock them down, allowing the Emerald to distance itself from them. Later stages have speed pads, and even springs that will send the player through a series of Dash Rings. This page was last edited on 19 September 2018, at 11:51.